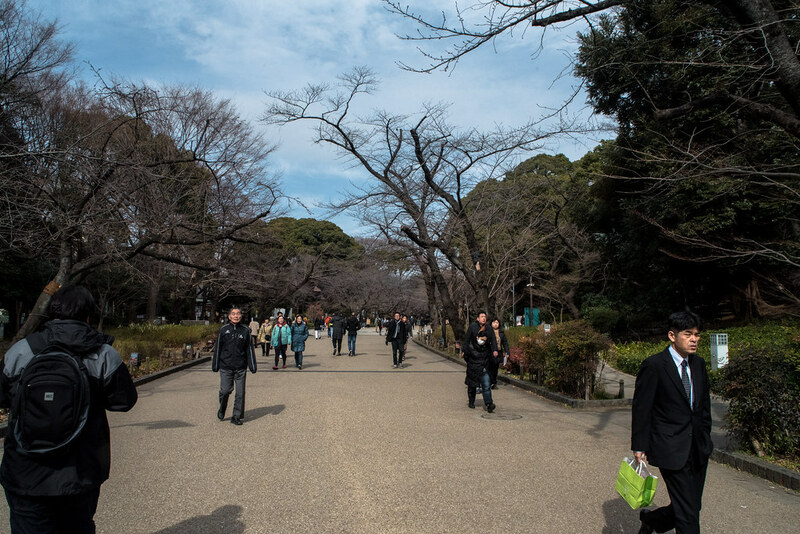 As I mentioned in a prior post, on our first day in Japan we visited the Ueno Park in central Tokyo. The park was built around the Kan’ei-ji pagoda in Ueno (which unfortunately we were unable to visit, as it is now located in the Ueno zoo). The choice of location for this temple is quite interesting. In traditional Japanese culture, there is a belief in Konjin, a kami (a spirit in the Shinto religion) which is said to move location and change direction based on year, lunar month, and season. The direction that this spirit is present in is said to be unlucky, as this kami is known to be keen on violence and punishment via curses. To avoid this bad luck people may take part in katatagae, the practice of changing direction to avoid facing in to the direction which is unlucky at that particular time. The Kan’ei-ji pagoda in Ueno was built in 1625 on the land to the north-east of Edo Castle, which was said to be an unlucky direction at the time. This was ordered by Tenkai, a famous Buddhist monk of the early Edo periods in an attempt to ward off evil spirits coming from this unlucky direction. Various buildings in this area were destroyed over various wars, until the Ueno park was established in 1873. 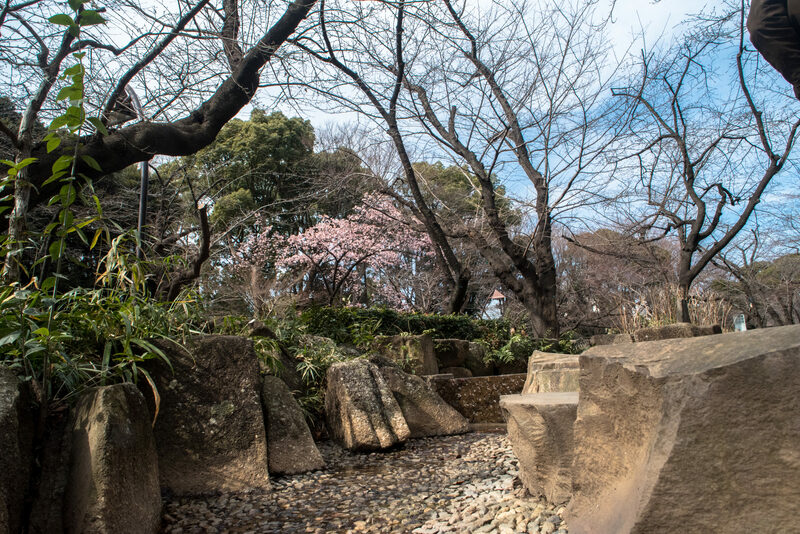 One of the main attractions of Uneo park is that it has a huge number of cherry blossom trees. 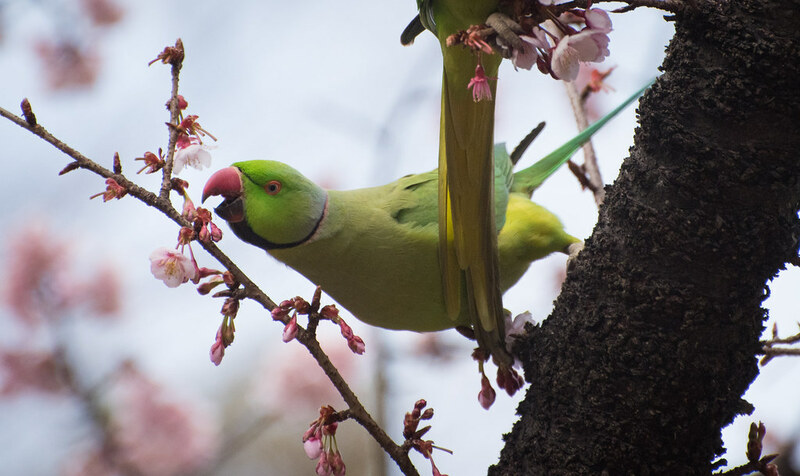 As I said before, there was very little sakura to be seen; the few trees which were flowering were being attacked by marauding birds. Within the park we were able to visit the Kiyomizu Kannon-do temple. 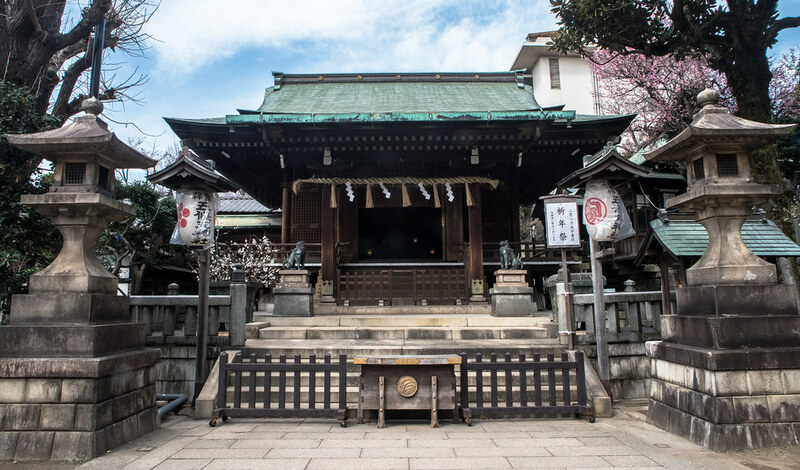 We were informed that it was not allowed to take photographs of the front of the temple, but prior to this I did take a photo of the chōzuya nearby. 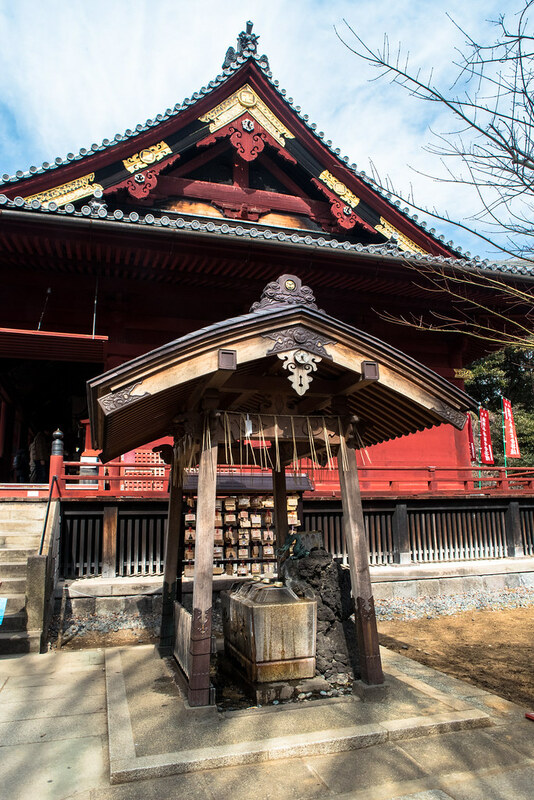 Chōzuya, or purification fountains, are to be used in the purification rite known as temizu in the Shinto religion. The temizu ritual consists of washing yours hands using water from the fountain. This must be done in a specific manner, and I would recommend either looking up a guide online or watching other people do it a few times first if you wish to partake. After completing this ritual, you may move on to the temple (although I daresay no-one would bat an eyelid if you skipped this step when visiting a temple). Kiyomizu Kannon-do, built in 1632, made up part of the Kan’ei-ji temple grounds. It has previously been moved from a different location within the park, and has gone through a full-scale restoration in the past. 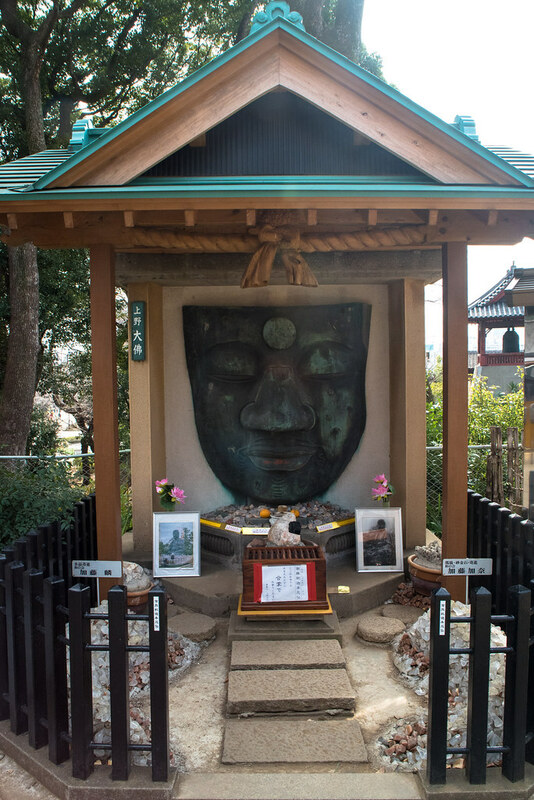 It is still said to be one of the oldest surviving temples within Tokyo. Another interesting site to see within Ueno park is the remains of the Ueno Daibutsu (daibutsu meaning “giant Buddha”). The Ueno Daibutsu was a giant statue of Buddha built in the Edo-period, in 1631. However, it has been heavily damage by earthquakes, fire, and war. Now, only the face remains. Standing out quite strongly within the Ueno park is the long line of bright orange torii gates. 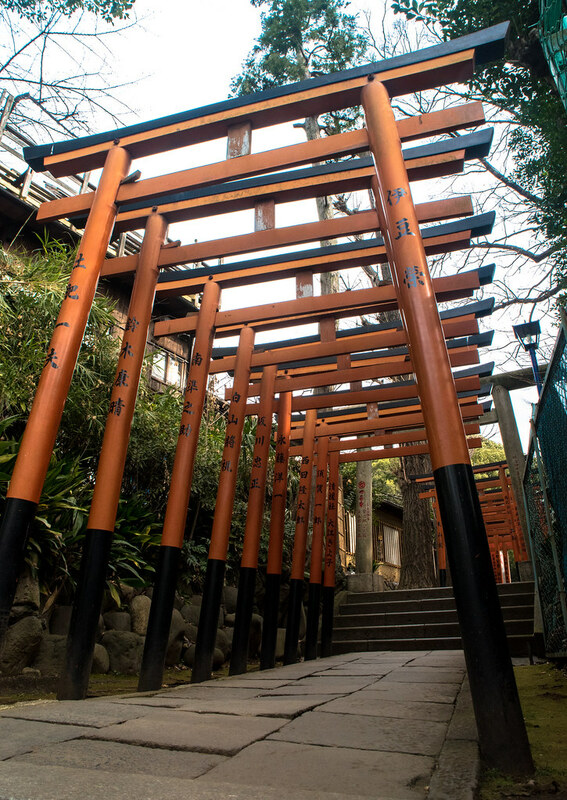 These torii (which literally means bird abode) are said to symbolise the transition from mundane to sacred as one approaches the Shinto temple grounds. They can be made of a variety of materials, and are a common site around much of Japan. The ones in the picture above are on the approach to the Gojōten Jinja shrine, which can be seen below. Our visit to the Ueno park was quite short, as we were still quite groggy from the flight. I would love to be able to visit the park again during the sakura festival one day. If I had more time I would also like to be able to visit the Ueno Zoo, which is famous for its Pandas. Previous Post Snow in Salisbury!